Philip Baltazar (left) field researcher and Rainier I. Manalo (right) program head of crocodile research and conservation both from the Crocodylus Porosus Philippines Incorporated (CPPI) install a radio transmitter at the back of the neck of a 6-foot female Philippine crocodile. A photograph of the Philippine crocodile (Crocodylus mindorensis) taken along the banks of Paghungawan Marsh in the town of Pilar in Siargao Island, Surigao del Norte. A Philippine crocodile (Crocodylus mindorensis) with a radio transmitter sprints into the waters of Paghungawan Marsh after it was released. 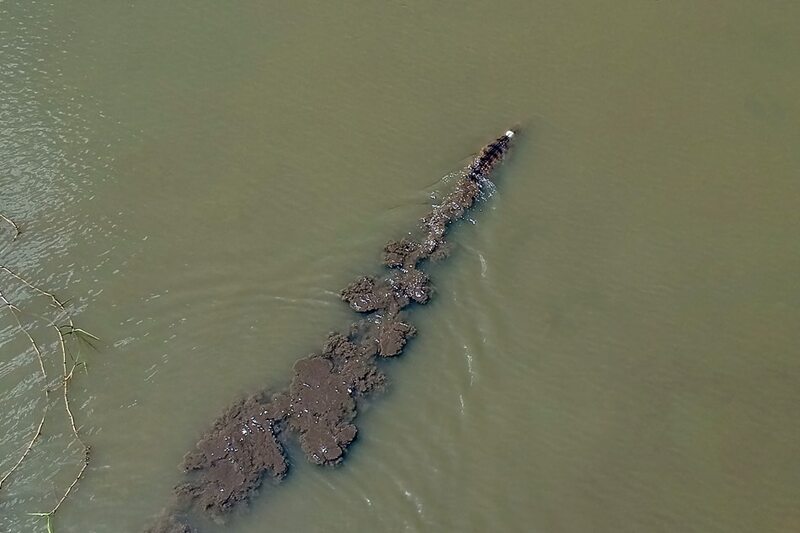 A newly installed radio transmitter is visible at the back of the Philippine crocodile as it swims across the waters of Paghungawan Marsh. 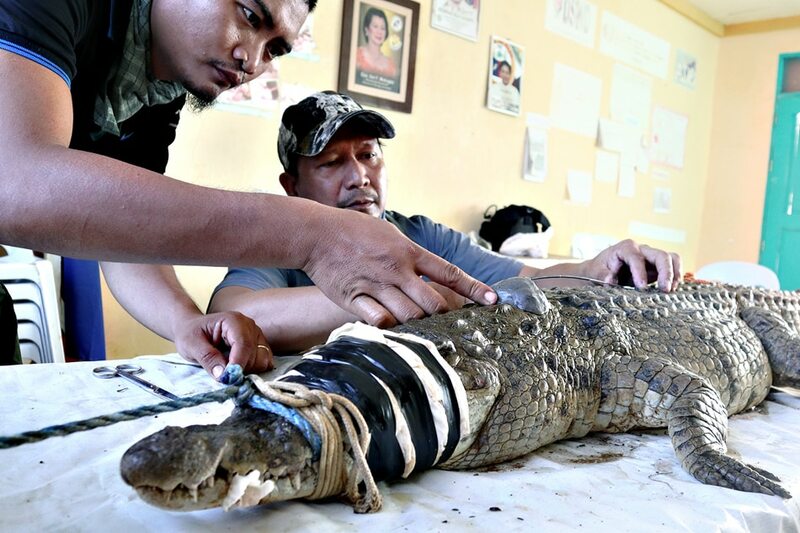 SURIGAO DEL NORTE – A non-government organization specializing on crocodile conservation has stepped up its research on the critically endangered Philippine crocodile in Siargao Island, Surigao del Norte. Rainier Manalo, program head of crocodile research and conservation of the Crocodylus Porosus Philippines Incorporated (CPPI), said the population of the Philippine crocodile is shrinking. “We should be proud that we have a unique crocodile, which is only found in the Philippines. Unfortunately, its dwindling population in the wild has listed it on the critically endangered species list. So much is needed to be done in terms of scientific research and study to fully understand the crocodile,” he said. The Philippine crocodile (Crocodylus mindorensis), which can grow up to 10 feet long, is a smaller cousin of the more abundant saltwater crocodile (Crocodylus Porosus), which can grow up to 20 feet long. According to the International Union for Conservation of Nature (IUCN) Red List of Threatened Species, there are fewer than 200 adult Philippine crocodiles in the wild. “There has been an observed decline in the overall population of 82 percent in the known localities and an estimated and inferred decline in the number of adults in the population by 85 percent to 94 percent over the last three generations,” it said. Manalo said the purpose of their research is to further understand the behavior of Philippine crocodile on their new habitat 5 years after they were introduced into Paghungawan Marsh in Pilar. “Initially, the aim of the introduction was to enhance the current knowledge on the biology of the species and to contribute to the tourism industry on the island. 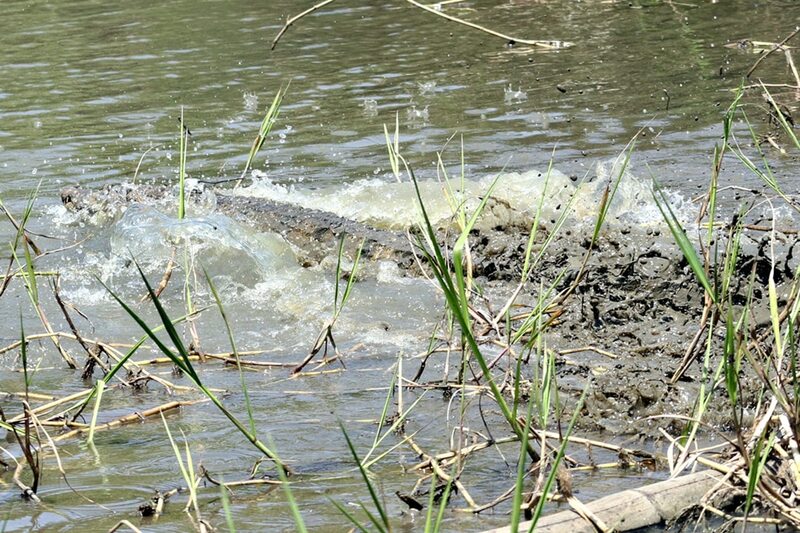 Now the crocodiles that we released 5 years ago are adults and on their reproductive stages. Hopefully, we can further monitor and continue our research study that will lead to understanding these creatures more,” he added. On March 22, 2013, 36 juvenile Philippine crocodiles were released in Paghungawan Marsh as part of the Siargao Island Crocodile Research and Biodiversity Conservation (SICRBC) Project. It was conducted by the Biodiversity Management Bureau of the Department of Environment and Natural Resources (DENR), CPPI, National Museum of the Philippines (NMP), Silliman University Angelo King Center for Research and Environmental Management (SUAKCREM) and Pilar LGU. “We again added the number of crocodiles on the wetland on July 17, 2017, when we introduced an additional 29 juvenile Philippine crocodiles. 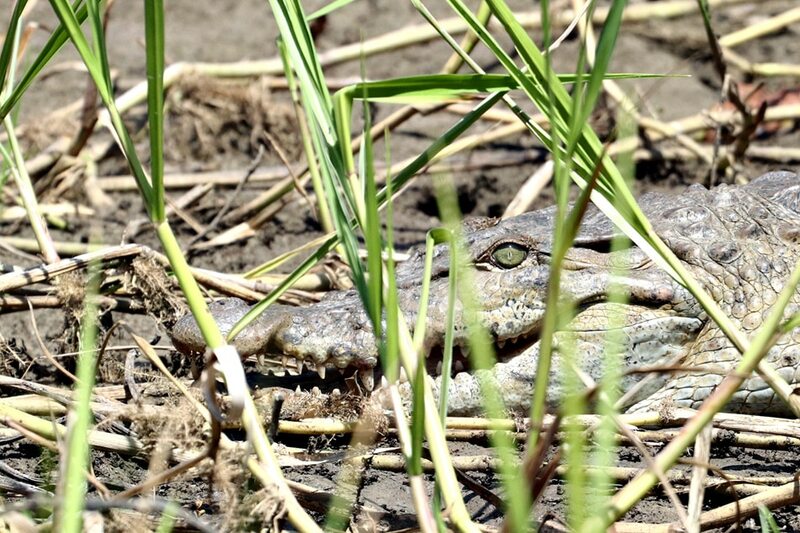 In total, we have already released about 65 crocodiles in the Paghungawan Marsh. Unfortunately, we received confirmed reports that about 4 crocodiles were found dead,” Manalo said. On July 27, 2018, the 3-man team from CPPI successfully installed radio transmitters on 2 female mature crocodiles in Pilar town and then released the following day. “They were both about 186 centimeters in length or about 6 feet. The first female that we tagged with the transmitter was about 25.55 kilograms and the second one was about 26.84 kilograms, which is indicative that we have a healthy population in the area,” Manalo said. Manalo said the radio transmitters will help them understand on how far the Philippine crocodiles travel along the protected wetlands. 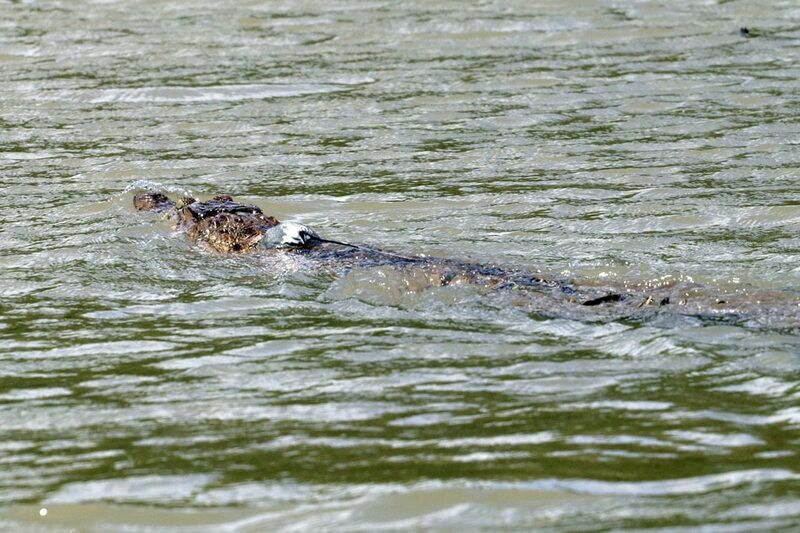 “This will also serve as baseline data in terms of overall distance of movement for future study as well as for other areas that might seem fit to introduce these species of crocodile,” he added. Philippine crocodiles are protected under Republic Act (RA) 9147 or Wildlife Resources Conservation and Protection Act. Violators will serve imprisonment of a minimum of 6 years and 1 day to 12 years and/or a fine of P100,000 to P1 million.